But the worst part is how transparently false it is, how indisputably and insultingly incorrect it is, how in-your-face-daring-you-to-not-burst-into-laughter wrong it is. Didn’t we just have a national mudwrestling match over a justice Donald Trump appointed? Was it because everyone was really concerned about Kegger Kavanaugh’s high school antics, or was it the fact that he would be a Trump judge? Are liberal weirdos offering Ruth Bader Ginsberg their ribs for transplantation because there is no such thing as a Clinton judge? Sorry/not sorry if I’m too real for you. A quarter century in courtrooms gives you a perspective about judges that the goo goo gang doesn’t have (and, of course, my mother was one in the state courts – if you think I’m too real, try stepping to Judge Mom). See, human beings tend to act in accordance with their beliefs and – surprise! – that’s what judges do too. It doesn’t necessarily make them bad people. It just makes them people. So, it’s just not true that judges are fungible. Who appointed them matters, period. But John Roberts and his establishment ilk want it to be true, so darn it, they’re going to keep saying it in the hope that someday it becomes true through sheer force of repetition. Of course, this kind of comforting fib – obvious to everyone, even you lucky folks who don’t do courtroom stuff for a living – reinforces the widespread belief among Normal people that the establishment thinks we’re stupid. We’re not. We’re woke. As my new book Militant Normals: How Regular Americans Are Rebelling Against the Elite to Reclaim Our Democracy, we’re not buying the grift anymore. We know the game is rigged, that it’s largely run for the benefit of the elite. Roberts utters this utter nonsense because he places the stability and prestige of the institution he has been charged with managing above all else, which is exactly wrong and will have exactly the opposite effect that he intends in the long run. He’ll get plenty of kudos for doing it though. Suddenly, the New York Times and the Washington Post will love him. They’ll try training him with treats for being a good boy. I hope they fail but, sadly, conservative domestication has worked before. See Jeff Flake v. His Own Party and His Campaign Promises (Arizona 2016-2018). The Fredocon geeks giddy at Justice Roberts’ ill-advised finger-wagging thought this would put Trump in his place. But Trump’s place is at the vanguard of the backlash against the baloney the elite keeps feeding us about its own alleged disinterested, competent stewardship of our institutions. Everyone sees that these Obama and Clinton judges are creating a special kind of law, Trump Law, where different standards apply because he is not one of the in-crowd, and because he represents the interests of the Normals, not the elite. Every other president has broad powers over immigration, but not the one we just elected. Why? Because the judges who so rule don’t like the way he is exercising his power. That’s not how things are supposed to work, but that’s how things do work today – and it’s indisputable that it correlates with who appointed the offending judges. That’s what John Roberts should be focusing one, the utter failure of his beloved institution to perform its duties at even the minimal standard of dedication to the principles it supposedly enshrines and from which it derives its deteriorating legitimacy. Instead of speaking the painful the truth, Chief Justice Roberts chose to attack the one guy who was telling it like every single one of us know it is. Instead of calling on his robed solons to do the hard work of applying the law and not their personal policy preferences, Chief Justice Roberts compounded the problem that is undermining the judiciary. Getting mad at Trump (and, by extension, the half of America that supports him) for pointing out that the judge has no robe is the most establishment thing ever. 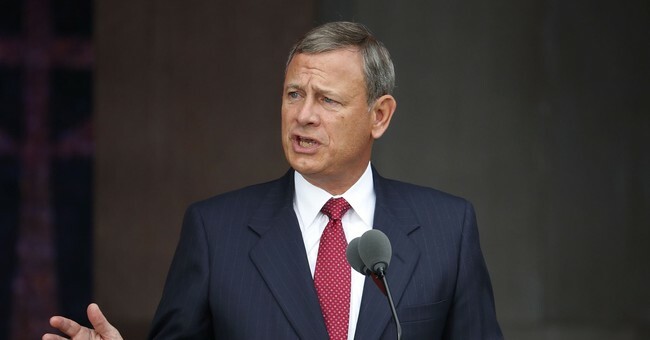 John Roberts thinks pushing pretty falsehoods is going to save his institution. He’s wrong. His aspirational lie and his sadly all-too-typical elite refusal to confront the bitter reality that his institution has utterly failed to do its job will do exponentially more damage to the judiciary than a million Donald Trumps ever could.